Akrotiri is the name of an excavation site of a Minoan bronze age settlement on the Greek island of Santorini, associated with the Minoan civilization due to inscriptions in Linear A, and close similarities in artifact and fresco styles. The excavation is named for a modern Greek village situated on a hill nearby. The name of the site in antiquity is unknown. 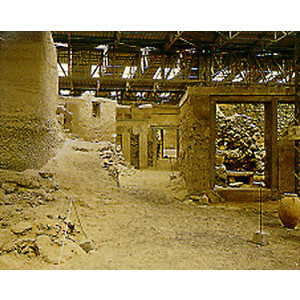 Akrotiri was buried by the widespread Theran eruption in the middle of the second millennium BC (during the Late Minoan IA period); as a result, like the Roman ruins of Pompeii after it, it is remarkably well-preserved. Frescoes pottery, furniture, advanced drainage systems and three-story buildings have been discovered at the site,whose excavation was started in 1967 by Spyridon Marinatos. Certain historians hold this settlement, as well as the disaster that left it unknown to most of history, as the inspiration behind Plato's story of Atlantis, as mentioned in his dialogues Timaeus and Critias. Excavated artifacts have been installed in a museum distant from the site (Museum of Prehistoric Thera), with many objects and artworks presented. Only a single gold object has been found, hidden beneath flooring, and no uninterred human skeletal remains have been found. This indicates that an orderly evacuation was performed with little or no loss of life. On the same mountain like Profitis Ilias monastery but further southeast, between Kamari and Perissa , Ancient Thira archaeological site (8.30-14.30, closed Mondays) has ruins dating from the 8th century BC when the Spartans inhabited the island .This hilltop position provided more safety from sea invaders . There is a stone paved road that drives to the top, next to the entrance of the site and a footpath. The path starts behind the new Hotel on the road to Ancient Thira and passes from the beautiful little church of the Holy Water where is a cave with the only fresh water spring on the island; If you decide to walk or mountain bike to the top ,better start early in the morning before the sun gets too hot. As their name suggests (New burnt one- old burnt one) the volcano craters are lava islands, the new being less than 200 years old. Most travel agents on the island sell boat trips to the volcano and its worth getting aboard one of the traditional caiques (traditional Greek wooden boats). They take you to the Nea Kameni island where you can walk (wear sneakers, the lava stones get very hot under the summer sun) to the rim of the carter and hopefully see them steaming sulphurous gases. Then the boat will take you to Palea Kameni for a swim in the hot spring on the shore.